Built in 1896, St George’s Cathedral commemorates the relic of St. George which was carried to the Battle of Adwa where the Ethiopians secured victory. It was designed by Sebastiano Castagna and built by Italian prisoners of war defeated at the Battle of Adwa. 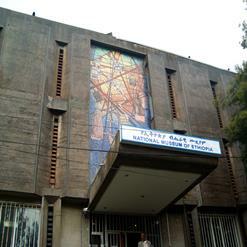 The outer walls of the cathedral are covered with paintings and mosaics by well-known artists like Afewerk Tekle. It also has a museum which features interesting artifacts including paintings and vintage costumes.